“If you were sitting here enjoying a drink or our cheese plates, and you’re looking, there are just walls and empty windows across the street — and then people just walking by,” said the State Street wine shop’s co-owner, Kim Buyer. 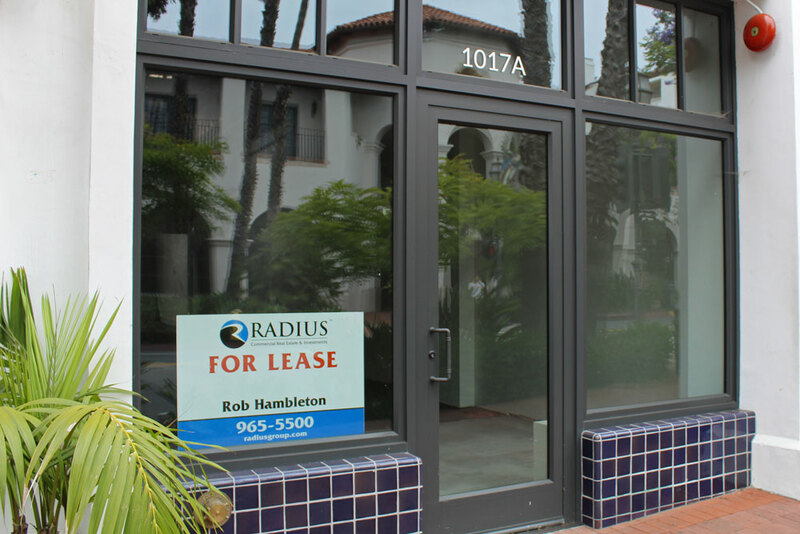 As the uptick in storefront vacancies along Santa Barbara’s iconic commercial corridor garners greater public attention, the presence of large signs on dark windows or logo-less facades has become one of many features of Lower State Street that stakeholders are considering altering as part of revitalization efforts. Signs are put up by the commercial real estate companies that will broker a new tenant’s lease on a property, and include information on square footage and whom to call for information. Like some State Street business owners, the city of Santa Barbara has posited that the signs emphasize the corridor’s vacancies and exaggerate their number. In communications with commercial real estate brokers, which continued Friday with a private meeting, city staff proposed potentially shrinking, moving or eliminating altogether the signage as one method of improving Lower State Street visuals. Nina Johnson of the city administrator’s office said changing the signs was one of many suggestions the city has heard from the public, though the signs’ owners aren’t keen on drastic changes. “I think that to do anything with the signage is just one small component of 15, 20 things that need to be done downtown,” said Bob Tuler, a co-founder and principal with Radius Commercial Real Estate & Investments. “Signage is a solution to filling the spaces, it’s not a reason for spaces being vacant,” said Michael Martz, an owner and founding partner of Hayes Commercial Group. There seems to be general agreement that the vacancy issue is a complex one that will not be solved with a single, simple solution. While business owners have argued that City Hall can and should step up efforts in general to address vacancies and ease burdens on local businesses, their views on the signage vary. For Buyer, whose wine shop is at 732 State St., the current signage works against the small-town vibe and tourist destination Santa Barbara works to cultivate. She contends that the city pays much more attention to the fine details of a business’ looks than those of vacant storefronts. “It looks awful,” she told Noozhawk of for-lease signs. Buyer said she’s been working with the city for months trying to obtain approval for a small chalk sign she can place on the sidewalk just outside Wine Therapy to draw in passersby. She said in her past experience, that marketing tactic has been extremely helpful in boosting business, and creates incentives for walkers and tourists to explore further up State Street. Buyer was one of a number of Lower State Street stakeholders to point to downtown’s Paseo Nuevo shopping center as a model for commercial vitality and imaging. “Right now, we’re looking great,” said the outdoor mall’s marketing and specialty leasing manager, Mary Lynn Harms-Romo. She reported a single vacancy at Paseo Nuevo, which was the result of moving a tenant to a larger shop. When one does pop up, however, the shopping center minimizes typical lease information on window signs, which feature a “business call to action” stylized to blend in with the storefront’s surroundings and theme. Martz told Noozhawk that Hayes would be open to changing up the look of their signage to make it more visually appealing, and Tuler said their positioning on facades could be tweaked. At Carpinteria’s State of the Community in April, Santa Barbara economist Mark Schniepp put the overall State Street vacancy rate at 3 percent — the highest it’s been since 1992. The city, businesses, landlords, real estate brokers and residents have cited a wide array of causes for State Street’s struggles, and don’t always agree on which or to what degree each is to blame. Many of them have said a key problem is panhandling and the presence of homeless individuals, especially those who sleep in the alcoves in front of vacant storefronts. In a town hall meeting last month, city officials laid out restorative-policing efforts being undertaken to address nuisance behavior and connect homeless individuals to services. Many business owners also say steep rents make it prohibitively difficult to break into — and remain — on State Street, and contend there’s more City Hall can do to promote the commercial corridor and ease the considerable hurdles they say prospective businesses face. Another cause cited by virtually all stakeholders has been changing shopping habits, especially among millennials, and the so-called Amazon effect — competition from online shopping sites that offer a wide array of products that don’t require one to leave the house. Johnson said that the dissolution of Santa Barbara’s redevelopment agency, which paid for urban development projects with property taxes, is another likely cause of Lower State Street’s perceived decline. Over the last five years, she said, $100 million of that money has gone to the state instead. In addition to restorative policing and an increased officer presence, the city has a working list of other remedies it is looking to employ. A popular one among all stakeholders is more art, especially in dark windows or in front of vacant storefronts. State Street’s underpass below Highway 101 is also slated for an art revitalization. Business owners have additionally recommended improving cleanliness, lighting and decorations. Eagerly awaited among all parties are the results of a study commissioned by Downtown Santa Barbara that assessed the commercial zone’s current retail mix and offers recommendations for improvement.